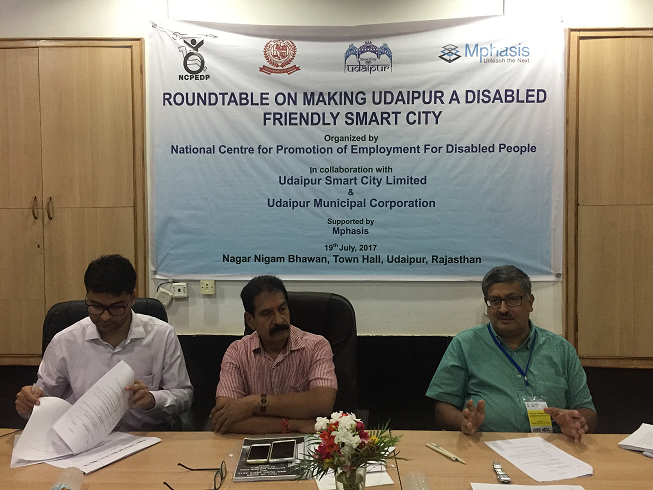 Javed Abidi, Honorary Director, NCPEDP emphasising the importance of Accessibility in Smart Cities from a legal perspective.From left to right: Sidhartha Sihag, Municipal Commissioner, Udaipur and CEO, Udaipur Smart City Limited; Chandra Singh Kothari, Mayor, Udaipur Municipal Corporation; and Javed Abidi, Honorary Director, NCPEDP at the Roundtable on Making Udaipur a Disabled Friendly Smart City organized on 19th July, 2017 at Nagar Nigam Bhawan, Town Hall, Udaipur. 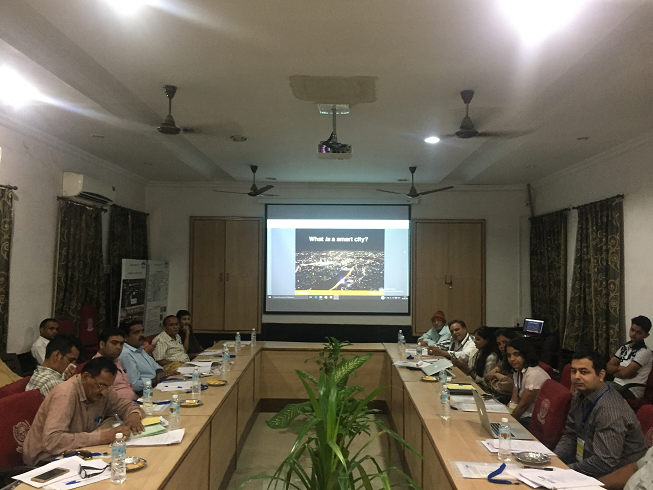 Sidhartha Sihag, CEO, Udaipur Smart City Limited giving an overview of the Udaipur Smart City Initiative. 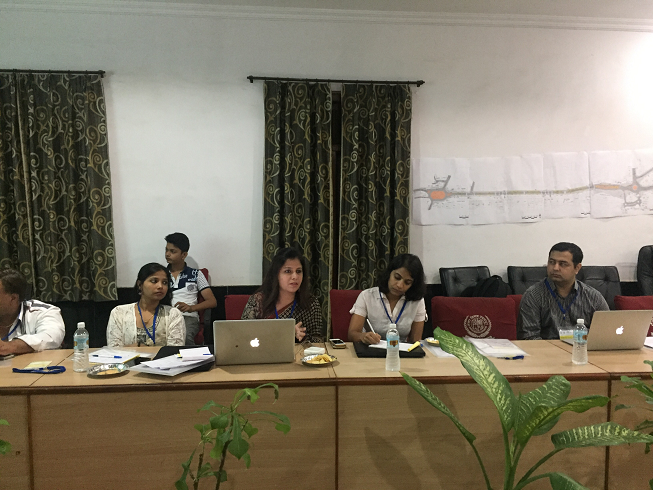 Ruchira Sarin, Principal Architect, Diversity and Equal Opportunity Centre giving a presentation on Built-Environment & Transport Accessibility in Smart Cities. 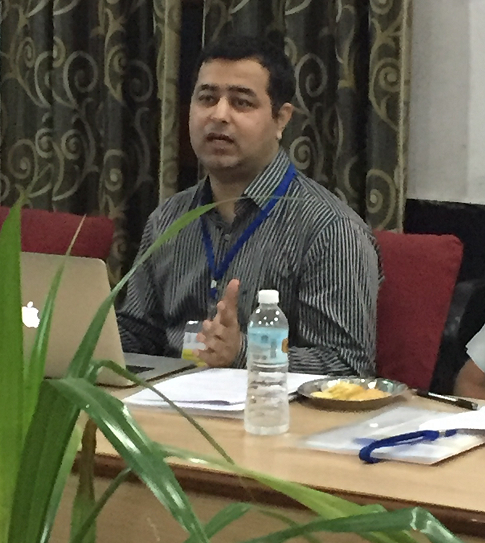 Shwetank Dixit, Head of Accessibility Innovations and Research, BarrierBreak talking about the Role of Cutting Edge Technologies for Accessible Smart Cities. 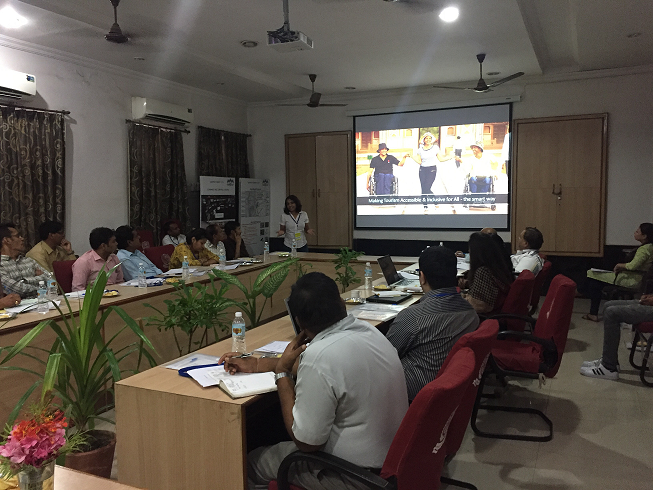 Neha Arora, Founder, Planet Abled presenting a case for Making Tourism Accessible and Inclusive for All in Udaipur. 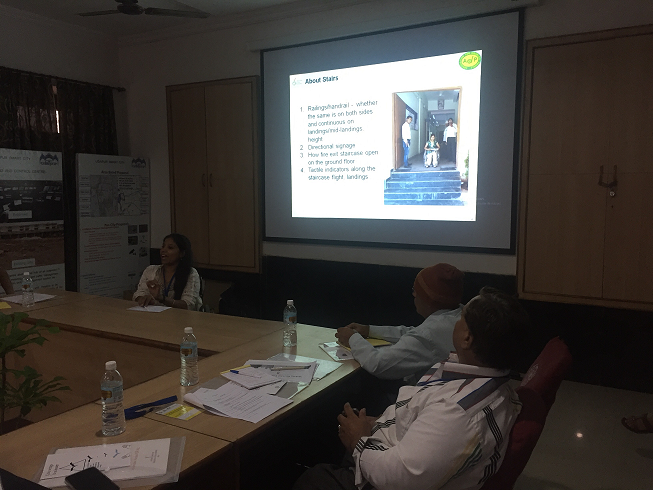 Suvarna Raj, Project Officer, Association for Disabled People giving her perspective on Built Environment Accessibility Audits. 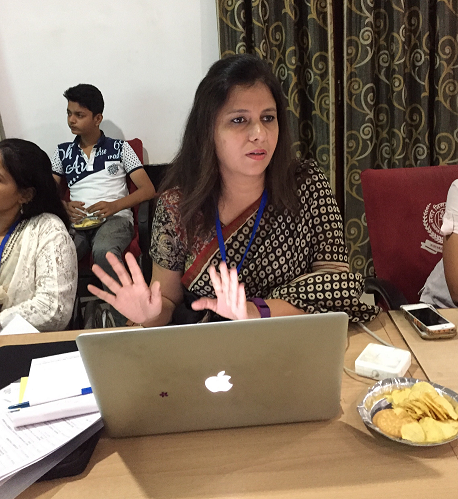 Interactions taking place with the Experts during the Roundtable.From left to right: Suvarna Raj, Project Officer, Association for Disabled People; Ruchira Sarin, Principal Architect, Diversity and Equal Opportunity Centre; Neha Arora, Founder, Planet Abled; and Shwetank Dixit, Head of Accessibility Innovations and Research, BarrierBreak. 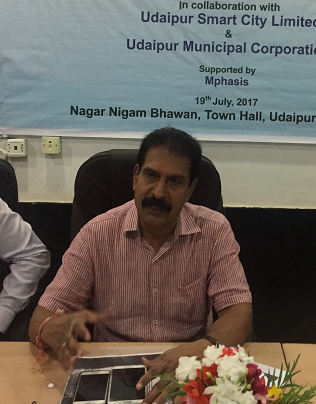 Chandra Singh Kothari, Mayor, Udaipur Municipal Corporation discussing the way forward for making Udaipur an Accessible Smart City. 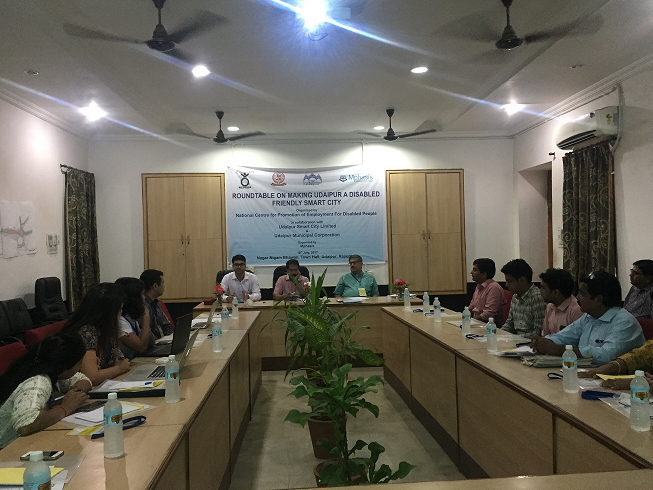 Participants at the Roundtable included representatives from the Civil Society and various government departments like Udaipur Smart City Limited, Municipal Corporation, Urban Improvement Trust, Public Works Department, Rajasthan State Road Transport Corporation, and Tourism Department among others.